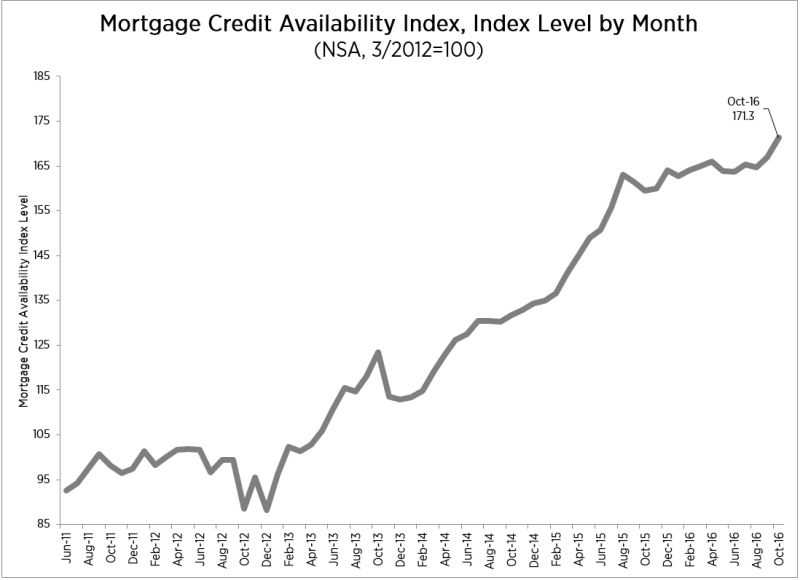 Several positive factors contributed to a rise in the Mortgage Bankers Association's (MBA's) Mortgage Credit Availability Index in October. MBA's Vice President of Research and Economics, Lynn Fisher explained, "The index was pushed up by an increase in the number of investors as well as an uptick in the availability of jumbo and high balance loan programs. We are also seeing greater availability of conventional conforming loan programs that are designed to provide home ownership to a greater number of consumers." The MCAI increased by 2.6 percent to 171.3 in October. Of the four component indices the greatest increase was in the Jumbo MCAI which rose by 5.8 percent. The Conventional MACI increased 4.0 percent, followed by the Conforming and the Government indices up 2.2 percent and 1.6 percent respectively. A decline in the MCAI indicates that lending standards are tightening, while increases in the index are indicative of loosening credit. The MCAI is calculated using several factors related to borrower eligibility (credit score, loan type, loan-to-value ratio, etc.). Base period and values for total index is March 31, 2012=100; Conventional March 31, 2012=73.5; Government March 31, 2012=183.5.